This month also happens to be the 150th anniversary of the beginning of the Civil War. It was on April 12, 1861, that General Beauregard ordered his troops to fire cannons against Fort Sumter. And so began the war to preserve the Union. That’s how President Lincoln viewed the war, as a fight to preserve the Union. He stated clearly that if some states were allowed to secede when they so chose, others would follow for their own reasons and the United States of America would cease to exist. This war would be the test of whether or not the USA would endure. Of course, what is not stated so obviously is that the issue over which the Confederacy and Union were willing to go to war was slavery, or more specifically, the spread of slavery to the western states. At the time of the Civil War, black slaves numbered 4 million in the South. They were both property and currency. Slaves were tangible and measurable wealth. But mostly, they were free labor. They were the living machines that cultivated cotton and food crops. They supplied cheap raw materials to fuel Northern manufacturing and textile operations. The South was not about to give up such a valuable resource without a fight. It would be easy for us Northerners to take the haughty position that we were so offended by slavery that we were willing fight and die for its abolition, but that would not be true. While it is true that slavery was illegal in the North, many northerners were ambivalent about the plight of southern slaves. The war between the states was initially popular, but quickly lost support as casualties mounted and, frankly, many northerners would have consented to a Confederate spin-off. After all, Northerners would have continued to do business with the Confederacy after secession, while at the same time still proclaiming a higher moral standard for the Union states. This attitude is actually still prevalent today in that many people abhor the thought of sweatshops in America, but are perfectly willing to buy goods from sweatshops in Mexico… which brings me to my next point. The outcome of the Civil War is well known. The North won. Or did it? True, the Union was preserved and slavery was abolished, but the underlying attitude behind slavery did disappear. The labor union movement that was so prevalent in the North a hundred years ago, never really took hold in the South. This meant that most of the good jobs were up north. This caused southern workers to migrate north, looking for those good jobs. However, that trend reversed about 30 years ago and jobs began heading back south. The lack of unions in the South yields a lower cost of labor and more profits for the owners. Companies found this appealing and moved operations south. Workers followed. The grand concept that workers should have some “say so” in their workplace was left laying derelict amongst the rusted ruins of northern steel mills and auto factories. The only things that have kept the South from returnng to out and out slavery are federal mandates from DoJ, DoL, and OSHA. Those federal agencies have provided some measure of worker rights. But federal mandates on the treatment of workers are still being challenged by conservative states that clamor for “states rights”. These federal policies were offensive to the Confederate states in the 1800s and are still offensive to them today. These states want to treat workers according to “local” standards. And with more and more companies moving their operations south, it looks like the South is now winning. So, as it turns out, the war never really ended after all. I have always believed, and I still maintain, that America peaked in the 1950s. Those times that we refer to as “Happy Days” were a time of increasing college education and home ownership, good salaries and pensions, and shiny new super highways. What has followed is steady decline. College is a “maybe”, home ownership is no longer part of the American dream, and pensions are things your parents had. America’s companies are now run by finance people instead of production people. Success is measured only according to shareholder value. Corporate executives live in isolated compounds and their life’s goal is only to acquire wealth. No longer do company heads see themselves as heroes in the community; I’m not sure that they even recognize the existence of community. And this shallow philosophy about the purpose of business trickles down, impacting how supervisors manage their workers and causing workers to be cynical about their role. I’ll leave you with one of my pet peeves. When I first started my working career, my company had a department called “Personnel”. But little did I know that there was a move afoot to do away with this department and replace it with a department called “Human Resources”. It was a trend that was sweeping the country. No longer would companies consist of people, they would be a collection of human resources. Companies would acquire, utilize, measure, reallocate, and dispose of human resources in the same way that they would utilize equipment, property, and capital resources. A brilliant advancement in world of business! I’m visualizing one of those corporate motivational posters showing a Southern slave auction with the slaveholder saying with a determined business look, “our people are our greatest asset”. 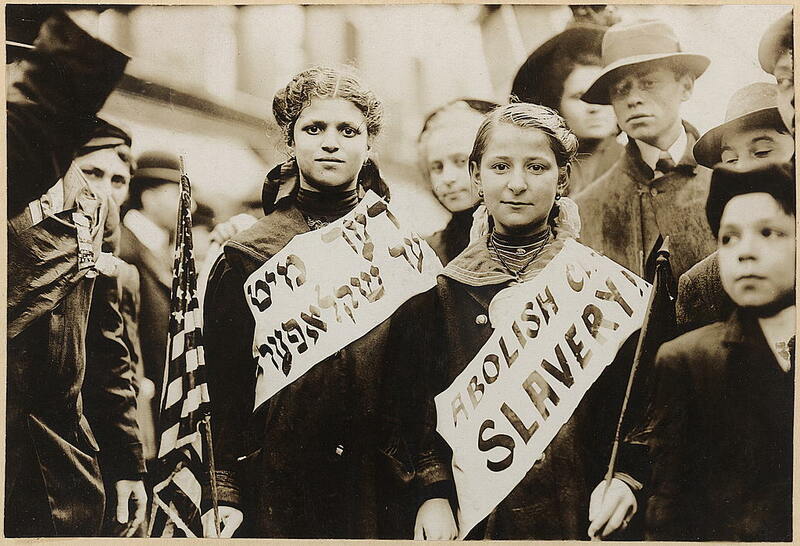 This entry was posted in Domestic Politics, Economy, Labor and tagged Civil War, corporate social responsibility, labor, labor unions, Passover, slavery, socialism, sweatshops by Rick DLoss. Bookmark the permalink.